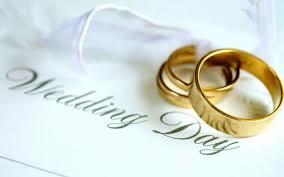 Please call the church office at 586/264-4777 to speak with the Pastor to schedule a wedding in our Sanctuary. Our sanctuary can seat 300 people comfortably. Officiator – Rev KC Lazzara, Pastor of SPUCC will officiate the ceremony. Wedding Coordinator – If you are choosing to be married at SPUCC, you will be required to use our Wedding Coordinator. On the day of the rehearsal, the Wedding Coordinator will direct the wedding party, and will be available to assist you on the day of the wedding in any way possible. Music – We require that all musical arrangements be made with our organist, Mr. Tom Rzonca. Additional recorded music is allowed in the Sanctuary with approval by the organist and Pastor. The Wedding Ceremony – Begins with 20-30 minutes of prelude music. After the prelude, there is generally special music for the seating of the mothers/grandmothers. Then the bridal party proceeds down the aisle, followed by the bride and father/mother. They arrive at the church altar where the groom, groomsmen and minister are assembled. A bridal march is accompanied by a processional tune. During the service, optional hymns or solos may also occur. At the end of the service, the bride and groom march down the aisle to a recessional tune. The ceremony concludes with an instrumental postlude as the guests depart. Unity Candle, Sand Ceremony, etc may be an optional part of the ceremony. Flowers – may be delivered on the morning of the wedding and may be placed on the altar, in front of the altar, in front of the pulpit, and the aisle pews. Plastic aisle runners, rice, confetti, birdseed and bubbles are not to be used on church grounds. Decorations are not to be taped or nailed to the pews. Photographs/Video Equipment – Only non-flash photography is to be used during the service. Flash is only permitted during the processional and recessional (please mention this in your program). Video camera placement must be stationary; taping is permitted during the entire service. Equipment can be set up 45 minutes prior to the ceremony. Marriage License – Residents of MI need to apply for their marriage license in the county in which one of them lives. Non-residents need to apply for their license in the county where they plan on getting married. You must bring the license to the rehearsal and wedding ceremony.